The 2011 Honda CR-V doesn't offer a manual transmission, but if you want one in a vehicle of this type you aren't completely out of luck: check out the Hyundai Tucson, Kia Sportage, or Subaru Forester. The 2011 Honda CR-V is homely, as well as unexciting to drive; yet it's a great minivan alternative on many counts—appealing to practical shoppers with a roomy, versatile interior and top safety ratings. The Honda CR-V is far from exciting to look at; it's a little bulbous and homely at first glance, and the interior styling isn't much more inspiring. But families looking for practicality, frugality, and versatility—but eschewing minivans—will find a lot to love in this roomy crossover. While the CR-V used to look more like a mini-SUV, with a boxier appearance, more upright stance, and a spare wheel and tire mounted on the back, its last full redesign made it more in line with the softer crossover vehicles. It could now be considered a more compact alternative to minivans—just with hinged back doors and a slightly more rounded roofline. Although the CR-V doesn't include paddle-shifters or the like, its 180-horsepower, 2.4-liter four-cylinder engine and five-speed manual transmission are surprisingly responsive. The CR-V isn't exciting to drive, but it handles confidently, and its available all-wheel drive system works together with the stability control system. Some vehicles this size attempt to cram three rows of seating in, but the CR-V has enough space for five adults in two rows. The back seat folds down for a completely flat loading floor, and in general the interior—with a low loading floor—feels larger and more usable than that of many other compact crossovers. The CR-V fits virtually all the practical tickboxes on your shopping list. 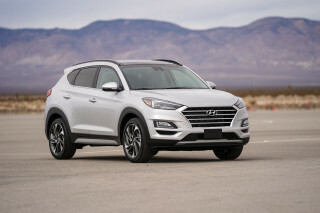 It has for several years been one of the best-rated vehicles of this size for safety, with top crash-test ratings and Top Safety Pick status from the IIHS. 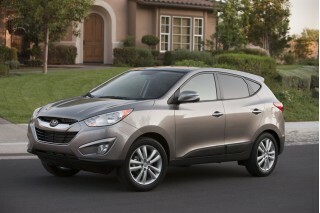 And it's been top-rated for reliability as well as for resale value. One area in which the CR-V is slightly disappointing is features. If you can live with a basic set of standard features, the base LX, or mid-grade EX, can be quite the deal; but in order to get an essential feature like Bluetooth (hands-free)—or a USB interface—you have to opt for the top EX-L model with navigation. As the Honda CR-V hasn't significantly changed since the 2007 model year, cited reviews are of vehicles for that model year or newer. A little homely on the outside, but conservative, upright, and straightforward on the inside, the 2011 Honda CR-V won't exactly pull in design-savvy shoppers. 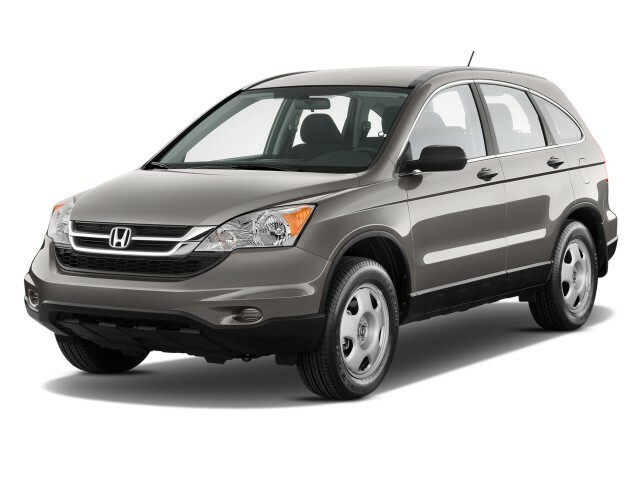 Depending on how you see it, the exterior of the 2011 Honda CR-V is understatedly attractive, plain, or a little weird. The rounded overall shape with a mix of sheetmetal creases and arcs looks well proportioned from some angled but awkward from others. 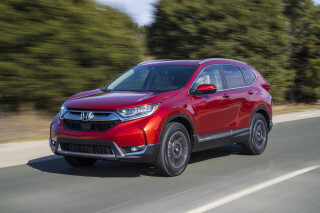 While Honda hasn't treated the front end of the CR-V with the same garish chrome grille as with the Pilot, Ridgeline, and Element, the CR-V has its own oddities; the contour of the rear window and hatch has always seemed a bit off to some eyes; to yours it could be either graceful or awkwardly jelly-bean-like, so take a walk around. The interior of the 2011 Honda CR-V is more tasteful and balanced—though conservative—and it should appeal to most people who don't need flamboyance. The upright instrument panel is a bit too upright and butch-SUV in styling, but it uses some pleasant contrasting materials and bright accents. Performance sure isn't the 2011 Honda CR-V's strong suit, but it's not an outright disappointment either. Honda has stuck with a single powertrain for the CR-V—a 2.4-liter four-cylinder making 180 horsepower, with a five-speed automatic transmission. Some other models in its class offer an optional V-6, and depending on whether or not you expect V-6 torque, you might either think that the CR-V comes up just a little bit short on grunt or is just fine. We think the latter; the engine does just fine in the CR-V, feeling surprisingly smooth and refined, with enough power for all but high-speed passing with a heavy load. Our only complaint is that the transmission is hesitant to downshift, resulting in lost momentum on steep grades. Despite the tall perch, the 2011 CR-V drives pretty much like an economical, comfort-oriented sedan; handling feels stable but not very sporty. An improved all-wheel-drive system is available, and it works with the stability control system to send power to the wheels where it's needed most. It's what inside that counts, and there's plenty of goodness here. interior of the 2011 Honda CR-V is very spacious and can accommodate five adults rather comfortably (only four if you have broad-shouldered passengers in the backseat). The shifter is located at the bottom of the dash, in a layout more like that used for some minivans, but that allows more open space. Although the driving position is good, the front seats could definitely be better. It all gets better in back, though; the CR-V has an adult-sized rear bench that feels roomier and more fully proportioned. Teenage children won't be suffering back there, and the beltline affords a good view out. The backseat itself is split into two sections and folds down to a completely flat cargo floor—it's split 60/40, but the seatback is split 40/20/40 to make it comfortable for a passenger back there even when you're carrying long cargo. Altogether, it feels larger and usable than some other vehicles in this class because of the rather low cargo floor (making it easier to load) combined with the tall roof. The hatch opens upward, rather than to the side, and the cargo floor measures 51 by 39 inches altogether with the back seats folded. EX and EX-L models get a dual-deck cargo shelf that's good for strollers, while LATCH child-seat positions are provided for all three positions in back. Generally, reviewers weren't tremendously impressed with the materials in the CR-V, but it's a bit redeemed by a good design. Ride comfort is good, and the CR-V's cabin is a refined place, relative to other vehicles in its class, but don't expect it to be luxury-car quiet. The 2011 Honda CR-V is a high-achiever for safety, with all the safety features you'd expect in this class plus top crash-test ratings. Safety features are a priority in a family-friendly vehicle like the CR-V, and it has all the features that are now expected, including electronic stability control, anti-lock braking, front side airbags, and side curtain airbags as standard. But the Honda CR-V is a safety superstar—quite possibly the safest vehicle in its class—because of its excellent "good" ratings—the best—from the IIHS. The CR-V has also been an IIHS Top Safety Pick. We're still waiting to see if the CR-V can maintain its top showing in federal crash tests as well; while it achieved five-star results in former tests, the NHTSA ratings system has been toughened for 2011, with higher thresholds for top ratings as well as a new side pole test. The 2011 Honda CR-V has an average features and options list for its class, but desirable tech features like Bluetooth are absent from most of the line. 2011 Honda CR-V is offered in a full range of trims, ranging from the quite basic LX up to very well-appointed EX-L. Honda tends to save many of the most desirable tech features for its most expensive, luxurious trims, and the practice can be frustrating for someone who wants a feature like Bluetooth, for hands-free calling, but doesn't want the EX-L's navigation system, or need dual-zone climate control, a power driver's seat, and premium audio. Not everyone has the budget for it either, for that matter. Mid-range EX models get that upgraded sound, as well as a moonroof, larger alloy wheels, and steering-wheel audio controls, as well as an upgraded audio system, but the top-of-the-line system, with a USB interface, XM Satellite Radio, and seven speakers, is also reserved for the EX-L with nav. If you can live with a somewhat basic features list, you'll find the CR-V a bargain. That said, the base LX and mid-grade EX are quite well-equipped. For this year, Honda has also introduced a Special Edition (SE) model that slots between the LX and EX and includes many of the EX features at a lower price. The 2011 Honda CR-V is powered by a fuel-efficient powertrain, but it's not much better than average on gas. CR-V's EPA ratings, of up to 21 mpg city, 28 highway, used to be near the front of the class, but over the past couple of model years there are many more good four-cylinder compact crossover wagons in its class, including several—like the Chevrolet Equinox and GMC Terrain (22/32)—that significantly exceed those numbers. To its credit, in repeated road tests, The Car Connection's editors have met or exceeded those numbers. 2011 CRV just some better than the 2000 in some ways. Blind Spots This car needs a seeing eye dog, the seats are like a park bench. The car runs great,but you get out on a long trip of 100 miles or more, when you get out you feel like you have been beat with a club. This will be my last Honda.